Eligibility: participants will be graduate students and early-career researchers from the New and Old-World tropics, with students from Latin America, the USA and Southeast Asia, brought together for the first course of its kind. The language of instruction will be English for which the students must demonstrate proficiency. Deadlines: Complete applications must be received by February 25, 2014. Final acceptance decision will be made by March 10, 2014. Costs: Funding from the Chinese Academy of Sciences and the U.S. National Science Foundation will cover the cost of airfare, visas and the course expenses except for personal incidental expenses. Course description: South East Asian forests have already been greatly impacted by rapid deforestation as a result of development and population growth. The growing risks to these threatened ecosystems from the impacts of climate change will be the focus of this new program bringing together participants and experts from five continents. In June to July, 2014 Xishuangbanna Tropical Botanical Gardens, Chinese Academy of Sciences (XTBG-CAS), will host an entirely new training course, on “The Ecology of Climate Change in the Tropics and Sub-Tropics”. This course has been developed as collaboration between XTBG-CAS and the Organisation for Tropical Studies (OTS-Duke). The course will bring together experts from around the world to teach different aspects of climate change ecology, from the practical, theoretical and social perspectives. It will use a mix of lectures on theory with practical field experiences on methods in a range of very different ecosystems across Yunnan Province, Southwest China. The course will encompass cutting-edge techniques and research technologies, and multiple perspectives on the interaction between climate change, biodiversity and ecosystem function. Topics will range from prediction (model-based approaches) to empirical research on species physiologies, and a timeframe from the Eocene to the future. Participants will be given the tools and insights to understand, interpret, evaluate and develop studies which integrate interdisciplinary forms of data to gain new insights into the ecology of climate change. Students will also develop and carry out their own independent research projects. The course will take place at the Xishuangbanna Tropical Botanical Garden, the premier tropical research centre in China on the northern margins of the Southeast-Asian tropics, and will include field-trips to tropical and subtropical forests, savanna, and a variety of agro-ecosystems. The steep climatic gradients in Yunnan make this the ideal place for the study of climate change ecology. 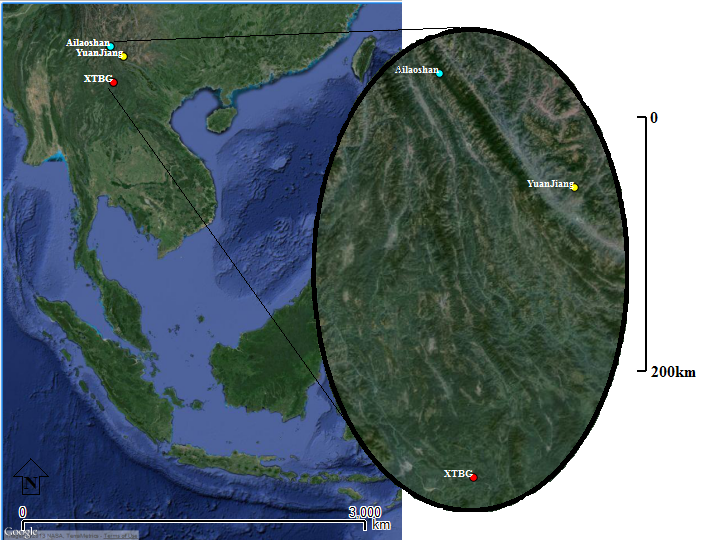 XTBG (and nearby CTFS Plot Bubeng) represents the Northern edge of the Southeast Asian tropics as well as largest Botanic garden in China (in both collection size and extent). Ailaoshan is covered in extensive montane subtropical forest, and associated vegetation types, whereas Yuenjiang is one of the few hot-savannah areas in Southern China, and represents the newest XTBG Field-site. All three sites are part of the ASIAFLUX network, and have long-term climatic records. Map of study areas: XTBG (Red): Main site; Hot Dry Valley (Yellow)-YuanJiang; Sub-Tropics-Ailaoshan (Turquoise).